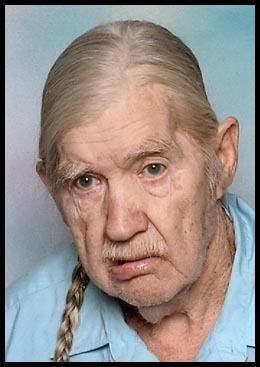 Herbert Lincoln Fortney, resident of Ponca City, Okla., passed away Saturday, Aug. 16, 2008, at his home surrounded by his family. He was 75. Herbert was born the son of James Otis Fortney Sr. and Irene Jeanette (Smith) Fortney on Oct. 23, 1932, in Pawhuska, Okla. He grew up in Oklahoma and attended schools in Nelagoney and Pawhuska. He married Mary Lee Sawyer in Bartlesville, Okla., at the courthouse on March 5, 1953, and to this union, four children were born. Herbert was employed with construction companies Evans and Troop in Oklahoma, C & K Bulldozer in Newkirk, Okla., and Kell Construction in New Mexico. He was also a truck driver, jailer and deputy security guard in New Mexico. Herbert was a foreman at White Mountain Ranch in California, but he was first and always a gold prospector in the mining business. Herbert hauled food for Food Share in Golden Valley, as well as in Dolan Springs. He was in a bowling league and was a lifetime member of the Disabled American Veterans. He is survived by his loving wife, Mary of Ponca City; children, William "Bill" Fortney and wife Margie of Grants, N.M., Roy Fortney Sr. and wife Karen of Shidler, Okla., David "Jake" Fortney and wife Rosemarie of Golden Valley, and Peggy Sue Todd and husband Craig of Kaw City, Okla.; brothers, James Fortney of Ponca City, Lonnie Fortney of Pawhuska, David Fortney of Nelagoney, Okla., and Darwin Fortney of Pawhuska; sisters, Dorothy Hope of Pawhuska, Sue Jones of Pawhuska, Mavis Redeagle of Pawhuska, Dee Dee Miller of Wynona, Okla., Nancey Penland of Pawhuska, Sissy Niblack of Nelagoney, Cotton Briggs of Nelagoney, as well as numerous foster children; grandchildren, Amy, Aaron, Heather, Laura, Renee, Dwight, Melissa, John, Sedona and Aaron Todd, who is currently in the Army National Guard serving in Iraq; five great-grandchildren; numerous nieces and nephews, as well as many greatnieces and greatnephews. He was preceded in death by his parents; brothers, Leo Merchant and Harry Merchant; sisters, Maxine, Lou Ann Washington, Billie Redeagle and Jean Meek; and grandson, Roy Jr.